Love the leg thrown back. We like to lie like that too. 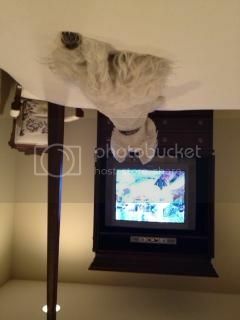 Bella is our telly watcher, but she sits up at attention. You are serious about that show, Duncan! What are you watching? Oh you look cute watching TV. Hope it is a great show!! Don't you love sitting with your feets out!? So comfy!!!! Are you addicted to television? You should turn off the television and go out an play. A bad day gone good!